Todd's been a parent for a bit under four months by this point in the story, I doubt he even thought about how the situation would look. I’m glad Mina didn’t ask anything about Amanda. They shouldn’t be discussing her until Todd is “officially” one of her parents. On paper it is official. Given the circumstances it probably isn’t. I assume that to give her up without telling the father Andi had to lie about him (“I don’t know who the father is”) and so he would not on the birth certificate. It isn’t. He’s her biological parent, yes, and there’d be a solid legal argument for him if he’d want to claim parental rights… But until and unless he does, legally he’s just a guy Amanda’s mother used to date. Four months… Okay, and how quickly did Andi get to take Amanda home? I remember something in the early strips about how long it took Todd to get approved, and that all happened before Andi even tried… I mean, I’ll buy that they’re much quicker to place kids with their biological parents, but still, Andi had to get past Lillian. Sorry, I know I’m among the great Andi defenders, but this still bothers me a little bit. Being able to prove biological relationship helped Andi short-cut a lot of the approval process. She first called the hospital and got started on Selkie’s first day of school, so it took her about three months to reclaim Amanda. Also I think that the process would take longer for a single male rather than a female. Of course my thinking this is based upon the book Martian Child, in which a bisexual single man adopted a kid who claimed he was a martian. Of course, a potential problem in the story here is that any reasonable adult that hears about how things went down is likely going to be pretty furious with Andi. Even the ones that might sympathize with the pressure she was apparently under are going to point out that She Done Fucked Up Bad and would find it hard to fault Todd’s apparent desire to have as little as possible to do with her. And yet it is very difficult for an unmarried father to object to having his child put up for objection. It works because Mina hasn’t heard about how things went down. If this was a different comic I’d be worried about a series of unlikely coincidences and bad communication skills on everyone’s part leaving Mina with her bad impression, but I suspect that this will be cleared up in a sensible manner. The minute both girls have been promoted out of Mina’s class, though…. Yeah, that’s a large part of how I feel, too. Todd definitely did a dumb thing, but I like that Mina is taking some responsibility for sending mixed signals. Yeah, that’s what I think I appreciate the most out of this, too. Mina did cross a line as a teacher that she shouldn’t have really been fudging by wanting to meet privately, and she’s willing to own up to that, and she’s the kind of person that you just know won’t make this mistake again. And now we get the fun moment of him explaining Andi and Amanda… that should be interesting! Can’t wait for Wednesday! Todd shouldn’t be too surprised that she knows something. Kids are terrible at keeping secrets, and they weren’t told to keep it secret anyway. Or she just heard it in the previous strip. The door seems to have been open. Webcomic time, sucker-punching me once again. FWIW, if you included all the text that the characters need to say to complete their thoughts, the characters wouldn’t be visible behind the wall O text. Like in frame #4 I’d love to know if she meant the kiss, or the meeting out of class, not happening again. And for Miss Affkahni: I HOPE you do not regret kissing him. I Hope You only regret it not being under other circumstances. You May find a better match, but you will never find a better man than Todd. 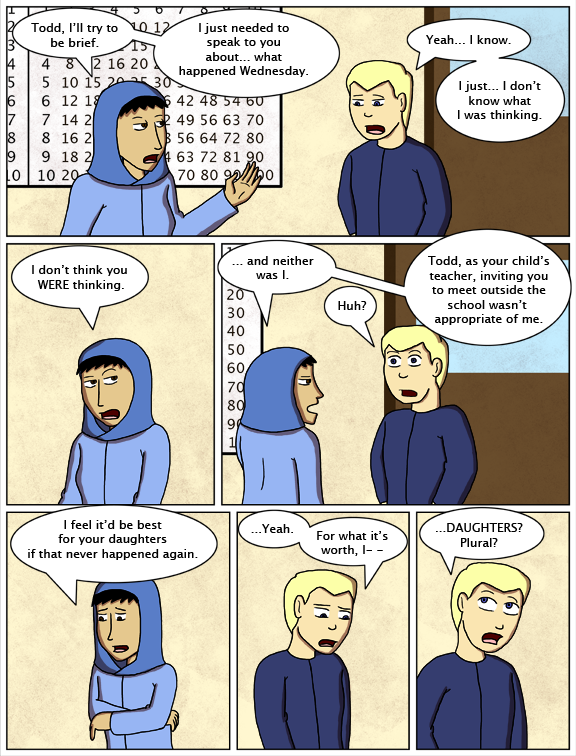 Todd isn’t used to the notion that he has *two* daughters, I think. Or that others are learning about it already. He’s barely even known for two whole days, after all. I’m not even sure he’s been able to tell his parents yet (could be he’s deciding to wait until after the dinner, and I’d be surprised if we didn’t get to see that reveal onscreen given the urn,) and almost certainly not his siblings. He’s probably just surprised how quickly she found out. As soon as the kids talked to her after being droppped off, I knew this was coming. That event – which seems like months ago 🙂 – was just 5 days ago? Wow. Actually, I don’t know if I thought that the aquarium announcement was the same week at all. Just some time later… Interesting. People! It’s a COMIC with fish people walking the dry land! The creator is not bound by your local laws about how long an adoption should take. Law is what the artist says it is. Relax, sit back, enjoy the story and stop trying to direct the scenes. Nope. I’m not sentient. After much careful introspection I have concluded that I don’t think, therefore I don’t exist. Please fix the functionality of the “Next” button from this comic.